Today finally marks the last day of 2007. I would like to thank all the kind-hearted souls who has helped A.L.L in one way or another. I would especially like to take this opportunity to thank J-Team artiste Michelle Tay, YES FM 933 Deejay, Peifen and Love FM 972 Deejay, Xiaoying for their help in publicising the plights of the animals on their blogs. Xiaoying not only helped to publicise, she even ordered 10 calenders to be delivered to her bridal shop at Tanjong Pagar! Although 2007 has ended, do continue to give the homeless animals your support! Edit (January 6 2008): Thanks to Mediacorp artiste, Kang Cheng Xi for lending his support to this cause too! This entry was posted in Uncategorized and tagged 2007, 2008, ALL, calender. With an adventurous boy as the main character, Miyazaki tells a story that involves discoveries and wonderful encounters, a story that carries a message of hope. This may be an old film of Studio Ghibli but I love it for it’s engaging plot! In fact, I like all the Studio Ghibli‘s productions which I’ve watched like My Neighbor Totoro, Spirited Away, Howl’s Moving Castle and Laputa. There are still some of their productions which I have yet to watch but next on my list are Princess Mononoke and Grave of the Fireflies. 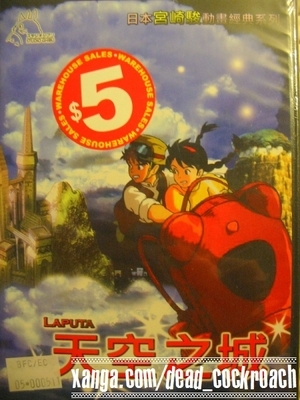 This entry was posted in Uncategorized and tagged anime, hiyao miyazaki, laputa, Studio Ghibli. Two days ago, I was having lunch with my mum at home when I heard Kitty mewing. I turned to look but she wasn’t there outside the door. However, her mewing seems to be getting louder and louder. Instinctively, my gaze turned towards the floor and there she was, staring back at me right beside my feet! My mum was just seating opposite me but she didn’t hear the mewing because we had the TV on. I panic and stomped my feet to chase her away – which she did, thankfully before my mum discovers her! I had to do that because I wouldn’t know what my mum would say if she saw Kitty begging inside our house! Then yesterday morning, after waking up, I went to open the maindoor and after checking that Kitty wasn’t there, I returned to my room. A while later, I heard my dad shouting. He has just woken up as well and when he stepped into the living room, he saw Kitty walking out from one of the vacant room! I had to run out from my room to chase Kitty out again. Luckily, my dad didn’t say much and just laughed it off. Somehow, I knew Kitty was looking for me because everytime I go out, she would follow me down the stairs and walk me off for a short distance. She would never venture beyond the boundaries of the void deck, which I guessed is her territory. She would stop there and send me off the remainder of the journey with her gaze till I’m out of sight before running ustairs again. This entry was posted in Uncategorized and tagged kitty. I did a simple banner for the sale of A.L.L Calendars. You can copy the following code into your blog or websites if you please. This entry was posted in Uncategorized and tagged ALL, calender, fund, raising, sale. This entry was posted in Uncategorized and tagged dead, terrosrist, video.